DOCTOR DOO: When Heavy Fog After Your Ride is GOOD!! What happens after your day on the water can help ensure your next day on the water is trouble free. One of the most damaging things that can be overlooked on watercraft or boats is the simple act of proper engine “fogging” after usage. Saltwater users pay extra attention! It’s simple to understand the need for this procedure when you consider its effect. Have you ever parked you car, truck, etc. a block or so from the ocean yet still notice that haze on your windshield from the salt in the air? Well, imagine your engine actually ingesting these tiny salt particles while running along that beautiful shoreline. It’s a scary thing to think about. But rest easy, Doctor Doo is going to explain the procedure to address the effects. While the ROTAX engine is running, all internal moving parts are getting their needed lubing via oils, fuels, etc. BUT how about the post ride coating of salt mist, or any water for that matter, that can cause rust, corrosion, and oxidation of all sorts? The post ride preventive maintenance is key to longevity and is simple if done regularly and using BRP’s high-quality XPS products. When conducting your post ride rinsing, flushing and preventive maintenance, follow the owner’s manual instructions for your model when it comes to “ENGINE FOGGING”. Two-strokes as well as four-strokes need this. On 4-TEC models it protects the critical parts including throttle bodies, intake valve stems, and the list goes on. BRP service technicians have fixed many carburetors due to frozen throttle shafts that could have been simply avoided by a little XPS lube in the right place after usage. Most all 2-Stroke Sea-Doo engines have the port on the flame-arrestor. Just 4-5 seconds of spray before storing even for a couple of days makes a difference! 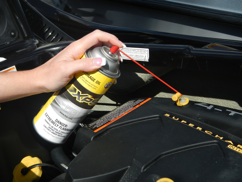 We strongly recommend using Sea-Doo XPS Anti-Corrosive Lubricant for this procedure. It is a true formulated fogging lubricant and one can should last a couple of seasons when used properly. I hope this removes the fogging mysteries, myths and clears the air regarding this simple yet important procedure! This edition of Doctor Doo comes from Glen Perry of Perry Performance Group renown as one of the leading Sea-Doo service centers the southeast United States and the world.